“The first rule of Write Club is tell six to seven people about Write Club”, Topher Payne. 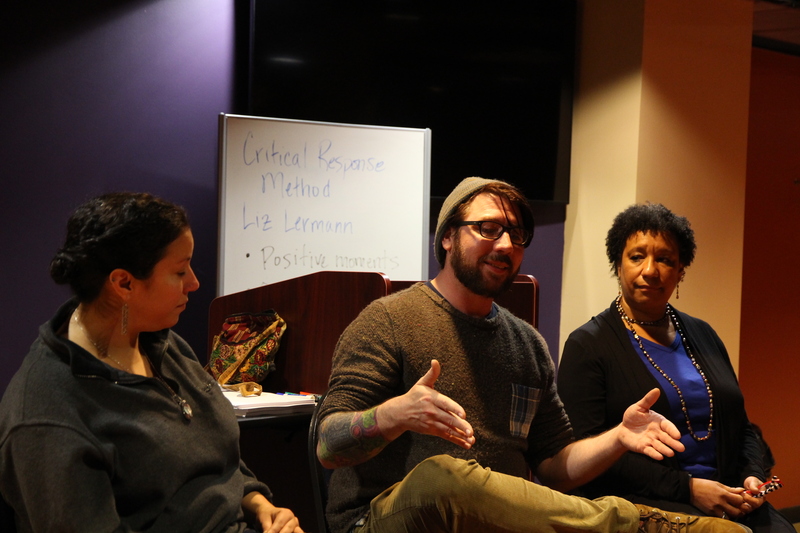 Major Moment was a series of workshops, discussions and performances put on by theatre professor Peter Friedrich and three guest artists, Topher Payne, Kathy Williams and Suehyla El-Attar. This event took place over two days and involved all types of students and faculty. Friedrich says he chose these three artist because students wanted people doing real, impactful things in their fields, not just giving lectures, and these three artists are some of the most progressive and active people in their fields in this region. Payne and El-Attar are both very active in the Atlanta theater community, and Williams works with a non-profit organization called Hidden Voices, which is stationed in North Carolina and works on projects to empower underrepresented communities and create social change. Friedrich says the main goal of Major Moment was to get students more interested in writing and to start this Write Club. For Friedrich it was important to get many different students involved in order to show that writing is not just for “writing types.” During the two-day period, over 50 students of different backgrounds and majors performed their own work in front of their peers. Ian Balknap originally started Write Club in Chicago. In the club, two people are paired together, each with a one-word prompt that challenges the other—for example, light and dark. Then each contestant performs their seven-minute piece, and after both people have performed the crowd decides a winner. Payne emphasizes the community aspect of Write Club. Writing is typically a solitary act, he says, but Write Club builds a community of writers, with diversity, different perspectives and traditions. “It is one thing to feel like you have a story to tell, but it is another thing to feel that your story is good enough to win over an audience,” Payne says about the power of the club. He also points out the competitive aspect of Write Club, noting the name being a play on the movie Fight Club. He says that one of his favorite things about Write Club is to see a first time competitor lose, and then be eager to get back up and compete again. He points out that this combination of writing and competition will help students no matter what they plan to do with their lives. Payne also noted how receptive the Millsaps community was, especially for being such a small campus. When I attended the Write Club event on Tuesday Night, I saw a diverse group of students performing their own work against one another. There were all types of students and faculty there, sharing their pieces full of comedy and emotion, bringing both laughter and moments of silent reconciliation to the audience. Afterward, the guest artists opened up the room for a question-and-answer session and offering advice to young writers—such as writing as much as possible, finding a good supportive community and, most importantly, not compromising your morals. Payne commented on the size of the Millsaps community, saying that what is important is not how small it is, but how close it is, which offers students more opportunities to have their voices heard and to break barriers that might be more difficult to break in bigger communities. He also noted that their visit simply “started the fire” and that it is up to us to keep the flame lit.